In early November 2004, I received a call from my friend and BBR volunteer, Lynn Holdridge. She would be transporting a female Basset from the Mauston area down to Muskego. Flash was given up by a backyard breeder and had given birth to three litters. When she was no longer needed, she was taken to a vet to be put down. She needed surgery and a foster home otherwise she would be going to the kennel immediately after being released from the vet. Lynn asked if Jim and I would consider fostering this little girl. We had just lost our Snoopy, BBR alumni #222. 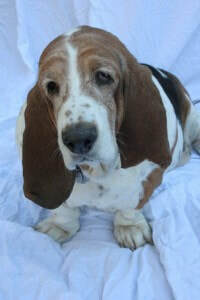 Lynn thought Flash would be the perfect foster for us because she was the opposite of what I wanted in our next Basset. I wanted a red & white male with a bit of an attitude. Flash was a 6 year-old female, tri-color, and happy. No foster failure with this one! Yeah, right. But I really needed another Basset in my life and I trusted my friend so we agreed. We picked Flash up from the vet in Muskego. She had been through a lot—5 teeth pulled, spayed, and removal of a malignant mass cell tumor. From her breeding experience, her poor belly barely cleared the ground. She was laid back and didn’t bark, just chattered her teeth. The drive home was not easy, she was a terrible passenger. She wanted to be in the front with us. We tried to block her and she ended up standing with her front paws on my forearm the whole way home. The first weeks were good… She didn’t counter surf. She loved her dog food and didn’t expect people food. She was house trained and there weren’t any accidents, even in the first days. The first day, when she wasn’t outside or eating, she’d go right into her kennel without being told. When told she didn’t have to stay in there she came out and wouldn’t go back in! …and not so good. She had separation anxiety when I left for work. Not the destructive type but crying and carrying on. Jim worked nights and had to sleep during the day but that was not to be. She broke out of her crate the first two days. We got her on meds to calm her but they hadn’t kicked in for several weeks. It was touch and go at first. I even told Suzanne we may need to find her another foster home. But with a lot of determination she became used to our home and part of our family. She was officially adopted on Valentine’s Day, 2005. So, what was Flash all about? She loved being in the car so much that when she’d get underfoot when we had deliveries, we’d put her in the car. We don’t think she ever realized she didn’t go for a real ride. Flash loved people. She didn’t bark at anyone but wagged her whole body, apparently thinking they could hear it. She spoke with her tail. She’d thump it when she wanted a belly rub or when asked if asked a question that had a “yes” answer. It would not move it the answer was no! Flash wasn’t afraid of much. The loudest thunderstorms never woke her. BUT if a fly was in the house she’d have terrible anxiety attacks until the fly was killed, showed to her and flushed. I wonder what happened in her life with flies—I’ll never know. Flash was wary of other dogs. She came in with a partial ear, a little chunk out of her head and scratches on her nose. She didn’t mind dogs that were smaller than her. She did have some doggy buddies in the neighborhood, especially Rocky, a 13# mini Dachshund. She met him when he as 9 weeks old and immediately became his protector and playmate. They were inseparable. You could not walk one without the other. Both would stare at the other’s house looking for their friend. It was not easy when one or the other was on vacation. They were truly BFFs. Flash was not a warm weather dog but she LOVED winter. Five below zero meant it was time to go for a nice leisurely stroll. New snow meant snow angels. What a sight to see and hear. She was in heaven. Each year Flash had her own Christmas tree with doggie ornaments and presents, including packaged treats, for all her doggie friends under it. For two years, she never bothered the tree. The third year apparently she decided her favorite treats weren’t to be gifted. She ate all of them, leaving the empty packages as evidence. The toys were not touched nor were some of her non-favorite treats. We still can’t believe she didn’t get sick. Flash went in for her annual checkup in February 2008. She passed with flying colors. Three short days later she was back at the Vet. She had been drinking water by the gallon and having accidents all over the house, all the time. She was diagnosed with diabetes. We never could get it under control but we did get it stabilized. She received two injections a day and life went on. The accidents stopped but she was getting special food and I was baking her doggie treats. I don’t even bake for humans! At her annual checkup in February 2009 all was well. 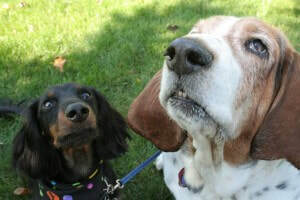 A couple of weeks later I noticed her eyes were getting a little cloudy, not unusual for a 10-1/2 year-old Basset. Back to the Vet who confirmed she had cataracts. Within a week she was totally blind. WOW. We took her to a specialist inquiring about surgery. He said she’d be a “fair” candidate for cataracts. Given the less than stellar prognosis and the fact that her diabetes was not under control, we decided against surgery. She moved around the house and yard like any sighted dog. She no longer tore through the rooms when the refrigerator door was opened but she did get there in good time and without crashing into anything. She was content to be with us in the yard sniffing the air and listening to the birds. The next year I decided I had enough of February checkups and took her in January. Aside from the diabetes and blindness, she was doing okay for her age, 11-1/2. Just a couple of weeks later we noticed she no longer cared if guests were in the house, even her favorite humans. Then she started getting “lost” in corners. Then, little seizures. We talked about, took her to the Vet, and kept her comfortable. It was so hard to witness. On March 16, 2010, she had a seizure when Jim was home with her. He called me on my cell and asked me to get home right away. I was a few blocks from home and was there in a minute. I spoke her name and she did respond but just laid there. We called her Vet and her final appointment was at 6:40 pm that evening. We laid on the floor with her all afternoon, crying, petting her and telling her how much we loved her. It was so hard. Our heads told us we were doing the right thing but our hearts were breaking. She was so wonderful to have in our lives. She was everything a dog should be—funny, smart and sweet. We miss her so much.